Everything in Linux is either a file or a process. / The root directory, the top-level directory in the FHS. All other directories are subdirectories of root, which is always mounted on some partition. All directories that are not mounted on a separate partition are included in the root directory's partition. /boot Includes Linux startup files, including the Linux kernel. Can be small; 16MB is usually adequate for a typical modular kernel. If you use multiple kernels, such as for testing a kernel upgrade, increase the size of this partition accordingly. /dev Hardware and software device drivers for everything from floppy drives to terminals. Do not mount this directory on a separate partition. /home Home directories for almost every user. /lib Program libraries for the kernel and various command line utilities. Do not mount this directory on a separate partition. /mnt The mount point for removable media, including floppy drives, CD-ROMs, and Zip disks. /opt Applications such as WordPerfect or StarOffice. /proc Currently running kernel-related processes, including device assignments such as IRQ ports, I/O addresses, and DMA channels. /sbin System administration commands. Don't mount this directory separately. /usr Small programs accessible to all users. 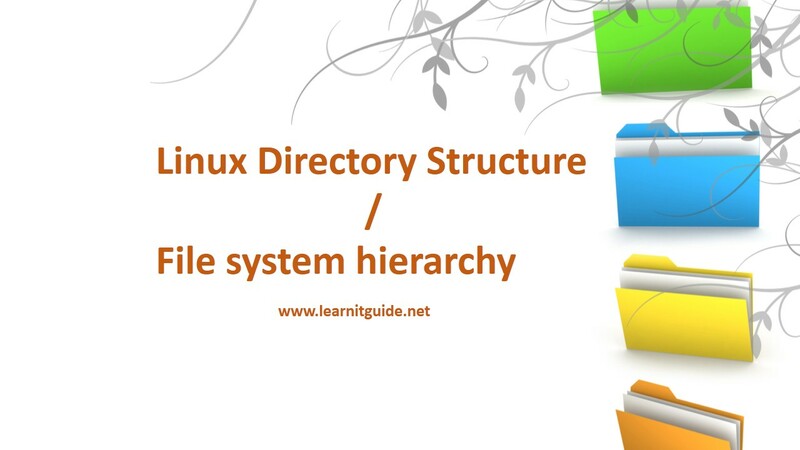 Includes many system administration commands & utilities. If there is a file called mydata.txt under /home/user1/, then the full path of the file is "/home/user1/mydata.txt". Regular files These files are similar to those used by the file systems of other operating systems—for example, executable files, OpenOffice.org files, images, text configuration files, etc. FIFOs FIFO stands for First In First Out. These are special files used to move data from one running process on the system to another. A FIFO file is basically a queue where the first chunk of data added to the queue is the first chunk of data removed from the queue. Data can only move in one direction through a FIFO.